In dedication to my father and my father-in-law and their love for this beautiful tropical fruit. They both used to tell me how wonderful this fruit was and how important it was to eat a least a slice everyday especially in the morning. It shouts out a powerhouse of health benefits……. Papaya a very popular fruit In Mauritius and can be found in almost every part on the island. 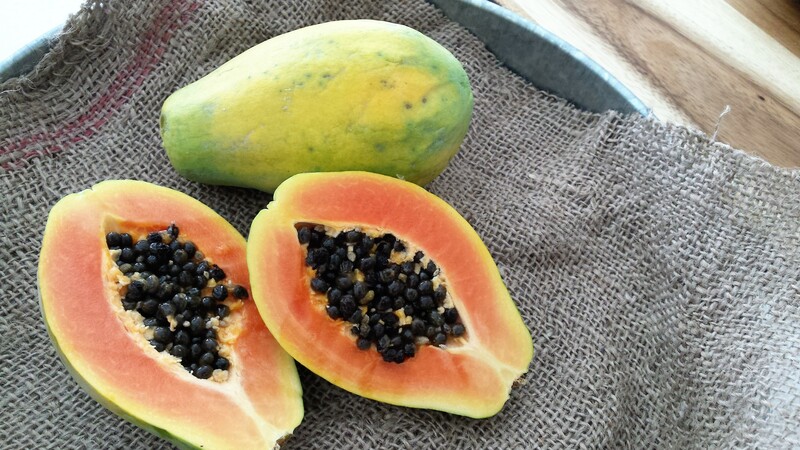 Like many of the fruits we have on the island, Papaya or “Papaye” as we call it in Mauritius originating from South America. 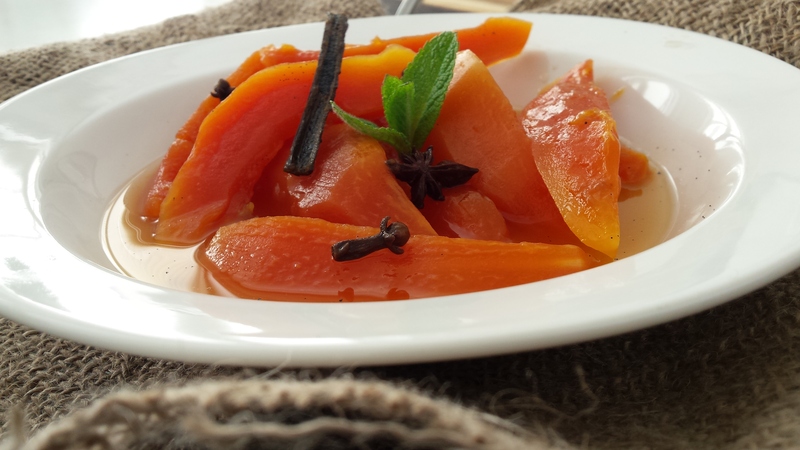 Papaya is becoming more and more popular and much loved by everyone of all ages. No doubt, papaya is renowned for its numerous health benefits. 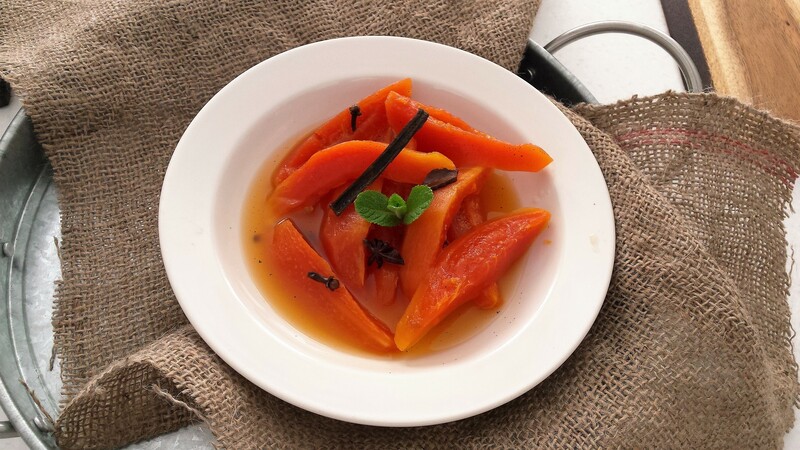 The whole papaya tree from the leaves, seeds, skin to the flesh can be used in some ways – nothing wasted since they all have their individual health benefits. The ripe papaya exudes with rich orange, yellow, pink colours – as you cut through it is encased with dark black seeds. Pretty colours, and even prettier and a very tasty fruit. 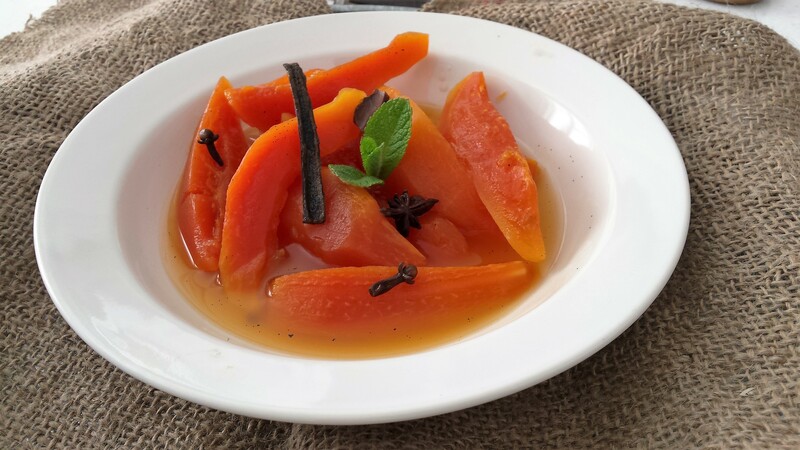 In Mauritius, we consume papaya both ways – ripe and green as and is increasingly becoming a favourite ingredient in many local dishes including dessert. 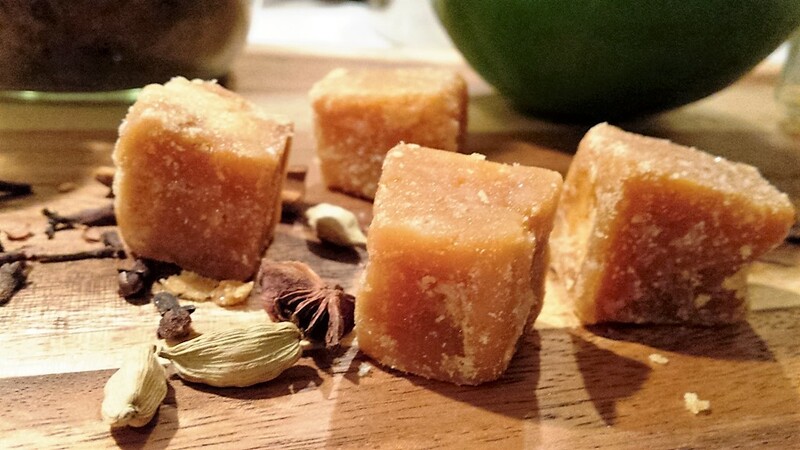 Today I will share one of my sweet recipe – known by many in Mauritius. It is one dessert that my late father-in-law used to make on open fire, cooked on low fire for hours until translucent, soft and exquisitely moreish. Unfortunately he is no more for me to share my version of “Compote Papaye” with him, but I do hope I can only make him proud that I have tried to replicate his recipe – with a little twist. On the sweeter side of things, I have combined in my recipe a concussion of aromatic spices to enhance and lift the flavours in the dish. This delicious sweet dish infuse with all these aromatic ingredients, which looks as pretty as it tastes can served on its own or with ice cream of your choice. It is a refreshing dessert after any meal. In a large saucepan add the sugar, jaggery, lime juice, lime zest and water bring together until the sugars have dissolved. Add the papaya, cinnamon stick, vanilla pods including the stick, cloves, cardamom, and star anise and bring to the boil then simmer on medium heat. Leave to cook slowly, moving the papaya around taking care not to let them break. Cover on low heat for at least 1-2 hours, checking and turning the papaya regularly. Add more water as required. Remove from the heat and leave to cool down completely before serving, I prefer to serve these chilled drizzled with the thick sirop. It can be served warm as well. Brinda’s Note: You can substitute the jaggery with dark muscavado sugar which will give the fruits a more darker colour almost a rich caramelise colour.